Our custom-built, web-based editor is here and it’s going to change the way you do email. With email testing at the core of Email on Acid, the introduction of our Email Editor is going to cut your email production time in half and vastly improve your testing workflow. In this blog, we’re going to break down, piece by piece, how to harness the power of our brand new tool to save time and money while building beautiful emails. Cut development time in half by seeing your changes made in real-time via the preview pane. With your raw HTML directly next to your email preview, you can say goodbye to toggling between your text editor and email service provider (ESP) every time you add a new table or swap out an image. 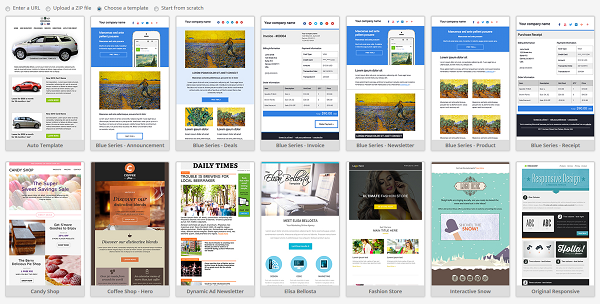 Now you can build, edit, preview and optimize your template all in one workflow. As you know, sending a test to just your iPhone or Gmail inbox won’t do the job. Almost every email client displays HTML differently because each client has its own unique way of interpreting your HTML. That is why your HTML code can appear broken in some email clients (like Outlook) even though the very same code is pixel perfection in another inbox. As you tinker around in your email code trying to troubleshoot line height issues or fix alignment problems in Outlook, thoroughly testing your template has never been easier (or faster). Start a test in the most popular clients and devices without ever leaving the Editor. No more copying/pasting code into a testing platform or sending multiple tests from your ESP. Building, previewing, testing and troubleshooting your email can now be executed in one place, with the click of a single button. Host, save and reuse images across all your email templates. No need to upload hundreds of images onto your own server or painstakingly place the image URLs into your raw code. We’ll unify the visual elements of your development process by hosting all your images in your own, personalized library in the Editor. Now, if you need to access past images or brand visuals like your logo, you can do so seconds. Dig into our reservoir of responsive and fluid hybrid templates that have already been thoroughly tested across the most popular inboxes. Whether you want to use media queries in your email or leverage an animated template, our library of templates will provide you with a wide variety of options. 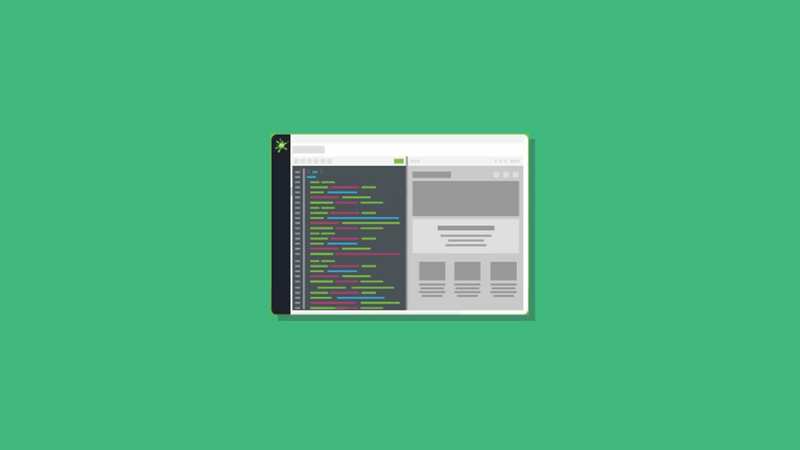 Don’t forget, when customizing your template a simple tweak in the HTML could cause display issues in an array of different clients and devices. Be sure and exhaustively test your email before you hit send. We all know that awful, pit-in-your-stomach feeling when you realize you closed a text editor or refreshed a browser without hitting the “save” button. Lucky for you, we offer a history of all your edits, so you never have to worry about losing work again. Plus, if you make an HTML edit that causes three other issues to appear, all you have to do is revert back to your last revision. Tracking, finding and fixing HTML issues has never been this easy. The Email Editor’s revision history tool allows you to take the quickest path for effective troubleshooting so you can shave hours off of your production time. Spend less time typing repetitive code and more time building beautiful email. 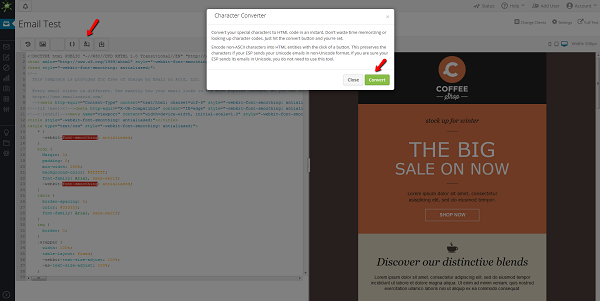 Harness the power of premade code snippets that will complete a complex action with a simple stroke of your keyboard. You can also create, save and utilize your own custom coding snippets to accelerate your coding with automated commands. Just type the shortcut and press Ctrl-E to replace it with your snippet. Some email clients (ahem, Gmail) require inline styles for your code. 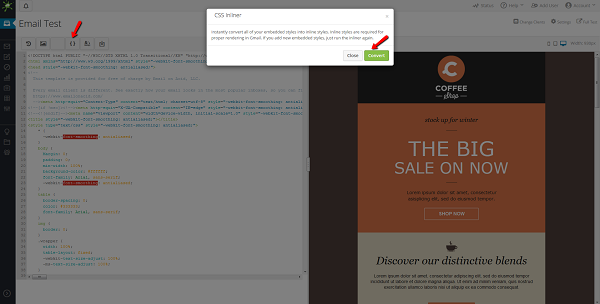 With the click of a button, we’ll inline all of your embedded styles so they’ll render everywhere. If you add new embedded styles, just run the inliner again. 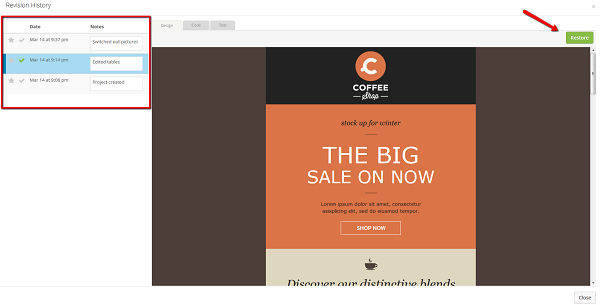 Now your email can look fantastic across all clients, even Gmail! Don’t waste brain space memorizing or looking up special characters. Convert them to HTML entities with our Character Converter. Just copy, paste, hit the convert button and you’re set. A quick note: The Character Converter will encode non-ASCII characters into HTML entities. This preserves the characters if your ESP sends your Unicode emails in non-Unicode format. The best part about Email Editor? It’s totally, completely and unbelievably FREE! The Email Editor will put your development process on overdrive so you can build and test edits in real time. All you have to do to get access is sign up for a free community account! To unlock testing in all of our 70+ email clients, you’ll need an EOA subscription. In addition to getting unlimited access to the Email Editor, you’ll also get access to free coding guides, marketing whitepapers, webinars and more. Building awesome email has never been this easy.